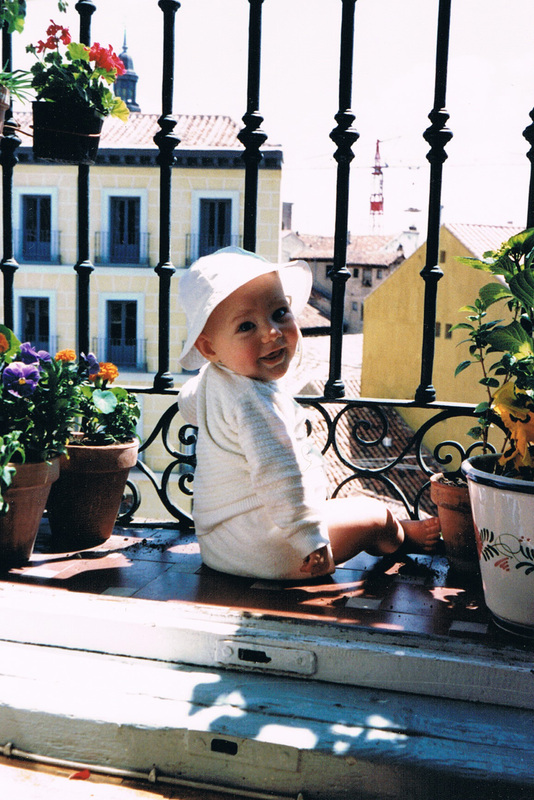 I’ve been indulging in a little nostalgia recently, remembering when we lived in Madrid in the ’80s, in a fourth floor flat overlooking the Rastro. The great thing about nostalgia is that you can pick and choose, and even if you remember the not-so-good bits, like hauling a sleeping child in a buggy up four flights of stairs, you don’t actually have to suffer being knackered again. Yes, real little Spaniards and, like all other Spanish children, admired, approved of, indulged and entertained. Is that just nostalgia talking, or was it really like that? What I remember is shopkeepers, waiters and neighbours happily talking to children and delighting in their company. They seemed to have infinite patience with them. I took all this for granted until we went back to the UK on holiday. I just thought it was normal for kids to be treated as if they were the centre of the universe. In England life was much more complicated. There were lots of places you couldn’t take kids, and lots of others where it really wasn’t appreciated if you did. This came home to me the first time I went back and met a friend in the coffee bar of the local theatre. Leah made a bee-line for the stairs to her practise crawling. The place was virtually empty, and she wasn’t in the way, but someone immediately rushed up and said, “Oh, you mustn’t let her go up the stairs – the bar’s up there!” Presumably they thought she was going to climb on a stool and order herself a gin and tonic. It was a great relief to get back to Spain. In comparison with trying to fathom the unwritten rules of how English toddlers were supposed to comport themselves in public, such things as dealing with Spanish officialdom was a walk in the park. When Sandy was two months old, I had to take him with me when I went to renew my residencia. It turned out to be an unexpected advantage. I had to hand in my papers on the first floor, up a staircase crowded with people, so I asked someone in uniform if there was a lift. “Come with me!” he said, sweeping everyone aside as he led me and my pram to the lift reserved for staff, and whisked me up to the first floor. He then escorted me to the top of one of the extremely long queues of people who’d been waiting for hours and announced to the woman behind the counter “I’ve brought you a customer!” as if I was the Queen of Sheba with the heir apparent. “Sorry…” I said guiltily to the person who’d been peremptorily pushed aside to make room for me. I hadn’t been expecting special treatment, I just didn’t want to haul the pram up the stairs. But in that situation you’d have to be a saint to say, ‘Oh it’s quite all right, I’ll go to the back of the queue’. Especially when the queue goes halfway down the stairs. Of course there were drawbacks to living in a small flat in a big city, but I can’t think of any right now. We had everything on the doorstep, even if the doorstep was down four flights of stairs. And OK, we didn’t have a garden, but the children didn’t seem to mind. They’d never had one, so they didn’t know what it was; and anyway, who needs a garden when you can sit on your balcony and throw Lego down into the street? This entry was posted in Life in Spain and tagged kids, life in Spain, Madrid. Bookmark the permalink. As an American, I think people in the UK and people in the USA have similar attitudes towards raising children. I have to say, from my perspective (and seeing how children behave in schools since I was an English teaching assistant this past year), I feel that Spanish children are over indulged! They grow up thinking they can do no wrong and are the center of the universe–I have seen so many be rude and so disrespectful to teachers (not all are like this but it seems to a lot of them are). I guess the teachers are used to it and maybe think it’s normal, but I was horrified at the way some students treated their teachers. It’s okay to let children be children–but it’s not a bad idea to teach them there is a time and place for good manners too!